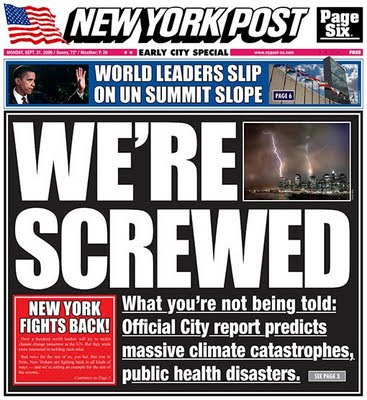 Early this morning, nearly a million New Yorkers were stunned by the appearance of a "special edition" New York Post blaring headlines that their city could face deadly heat waves, extreme flooding, and other lethal effects of global warming within the next few decades. The most alarming thing about it: the news came from an official City report. Distributed by over 2000 volunteers throughout New York City, the paper has been created by The Yes Men and a coalition of activists as a wake-up call to action on climate change. It appears one day before a UN summit where Secretary-General Ban Ki-Moon will push 100 world leaders to make serious commitments to reduce carbon emissions in the lead-up to the Copenhagen climate conference in December. Ban has said that the world has "less than 10 years to halt (the) global rise in greenhouse gas emissions if we are to avoid catastrophic consequences for people and the planet," adding that Copenhagen is a "once-in-a-generation opportunity." Although the 32-page New York Post is a fake, everything in it is 100% true, with all facts carefully checked by a team of editors and climate change experts. "This could be, and should be, a real New York Post," said Andy Bichlbaum of the Yes Men. "Climate change is the biggest threat civilization has ever faced, and it should be in the headlines of every paper, every day until we solve the problem." The fake Post's cover story ("We're Screwed") reports the frightening conclusions of a blue-ribbon panel of scientists commissioned by the mayor's office to determine the potential effects of climate change on the City. That report was released in February of this year, but received very little press at the time. Other lead articles describe the Pentagon's alarmed response to global warming ("Clear & Present Disaster"), the U.S. government's sadly minuscule response to the crisis ("Congress Cops Out on Climate"), China's alternative energy program ("Chinas Green Leap Forward Overtakes U.S."), and how if the US doesn't quickly pass a strong climate bill, the crucial Copenhagen climate talks this December could be a "Flopenhagen." Another ad promotes civil disobedience, encouraging readers to visit BeyondTalk.net and pledge to risk arrest in a planned global action November 30, just before the conference in Copenhagen. "We need strong action on climate change," said David Solnit of Mobilization for Climate Justice West, one of the partners in BeyondTalk.net. "But history shows that leaders act only when people take to the streets to demand it. 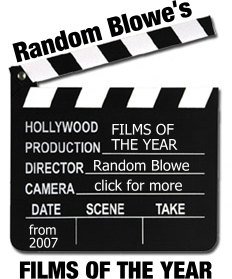 That's what needs to happen now." This paper is one of 2500 initiatives taking place in more than 130 countries as a response to the "Global Wake-up Call" on climate change.